A gang of "specialist marine drug traffickers" is facing jail after being convicted of trying to smuggle cocaine worth up to £122m into the UK. They were arrested after the 60ft catamaran Nomad was intercepted by Border Force in August 2018. 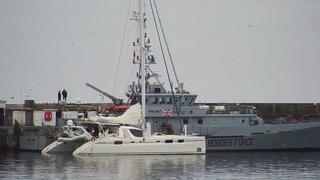 It was taken to Newlyn, Cornwall, with 1.4 tonnes of cocaine on board. The drugs were "destined for the streets of the UK" and taking them out of circulation had been a "big achievement", National Crime Agency (NCA) operations manager Ty Surgeon said. Mr Surgeon said UK nationals Nigel Clark, 64, and Dean Waters, 60, of no fixed address, were arrested on land at nearby Hayle in Cornwall, preparing to use a small boat to collect the drugs from the Nomad and bring them ashore. However, skipper Richard Must, 48, from Estonia, and crew members Voldemars Gailis, 21, from Latvia and Raymond Dijkstra, 27, from the Netherlands, were detained on the Nomad around 80 miles from land when Border Force officers intercepted them. Mr Surgeon said they left Plymouth, Devon, in June and sailed down towards South America, where the cocaine was loaded from another ship. When they were intercepted off the southern coast of the Irish republic on 29 August, he said the men threw their mobile phones into the sea. "These men are specialist maritime drug traffickers," he said, adding that they had been trusted with a cargo that had a street value of £112m. Mr Surgeon added: "They must be well connected and have good connections right down into the heart of the cocaine trade." Waters, Clark and Dijkstra were also found guilty of carrying cocaine on a ship. The five men are due to be sentenced on Tuesday, at Bristol Crown Court.